People contact us asking how to get rid of mice UK wide, as they are a common pest. House mice thrive in varied conditions, and it seems as if they are found in almost every part of the world. Many UK residents have at one time or another sought professional mouse pest control to get rid of a mice infestation in their house or commercial premises. These pests have been in Britain for a long time, with some sources of information showing that they have been around since the 9th century. Because of the nature of most homes, where we cram things into one place and they stay unmoved for a long time, mice find a ready hiding and breeding ground in diverse places. To assess how to best get rid of house mice we first need to know where to find them. 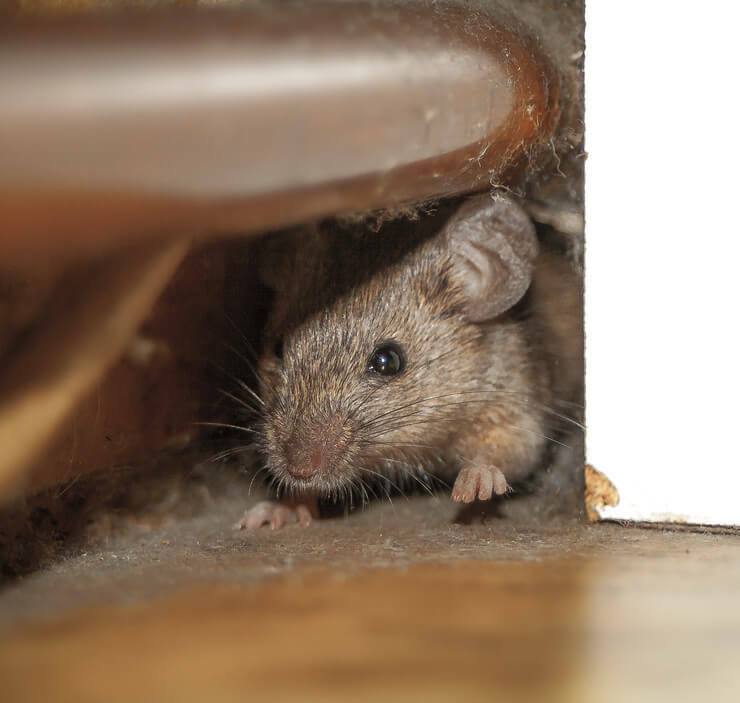 Our pest control London mice extermination and mouse removal team are experts in knowing how to locate these little pests. Mice will eat anything, that is, they are omnivorous, making them some of the most troublesome and irritating pests to invade homes, and to make matters even worse, they breed fast. Although they are small, they can cause serious damage to your household assets like soft furnishings and clothing. They are also known for causing allergies from their faecal matter. To be able to control mice, it is important to understand their habits first. House mice can be brown or grey, have large ears and small eyes. An adult mouse weighs about half an ounce and measures 5.5 inches to 7.5 inches including the tail, which measures 3 to 4 inch in itself. Although mice predominantly feed on cereals, they do eat other foods too. They drink water within their reach but can do without it if the food they are eating has some moisture content. With their acute senses of smell, hearing and sight, mice are not easy to exterminate from your home without the assistance of professionals. House mice will hide in many places, such as under the fridge, behind the bath panels, cupboards and so on, anywhere that seems secluded and out of reach. They will then venture out of their hiding places for food and water. It is easy to know when you have been infested by house mice, with the main pointer being damage to the property. However, if you notice bits of food or cereal that seem to have been nibbled on, it is a sure sign you have mice. If you have never had mice before, it can be hard for you to know how to get rid of them because their presence can be elusive. Should you suspect their presence, you should contact mouse pest control professionals for diagnosis, extermination and follow up as soon as possible, before their numbers grow. There are other ways to identify a mice problem. Look for droppings, tracks and fresh gnawing on furniture. All these signs indicate the presence of mice. You may also find mouse nests, made from minute shredded paper or cloth. If you are good with sensing smells, you will sense their definitive musky odour. You may also hear them scratching in the walls of the house. They are nocturnal creatures, coming out mostly when it is dark. You no longer need to worry about how to get rid of mice in your home. First, we will dispatch one of our mouse exterminator technicians to talk with you about your mice problem and to explain the procedure of the treatment. A thorough inspection of the entire premises follows, before the treatment starts. What is the mice extermination London cost? Mice control London pricing will depend on the level of treatment required. You will be surprised at our affordable prices. We use treatments that are safe for children. Any bait that we are going to use will be stored in plastic tamper-proof boxes. Once the extermination is complete, we will compile a report for you detailing all that has been done, and then we will arrange two follow ups to ensure that the mice don’t come back. On the first follow up, we will make sure that there is no trace left of the products used to get rid of the house mice. On the second follow-up, we will advice you on how you can prevent an infestation of mice in future.